Hard as it may be to believe for those who “hate” President Mohamed Nasheed and what he stands for, he would go down in history as the instigator of democratic change in the Maldives. Anyone who has closely monitored the struggle for people power that this nation has gone through, though it may not have seen widespread bloodshed as in most Middle Eastern countries today, there were those courageous few who dared to stand up against the dictatorship that was in reign for 30 long years. President Nasheed was the man whose spirit the regime could not break, the man who withstood each and every form of torture and overcame obstacles of all sorts that hindered his journey towards democracy, justice and freedom for the people of Maldives. The term “Anni Zindhaabaadh” is one you would hear frequently if you have ever witnessed any of the multiple peaceful mass gatherings that have taken place in the capital Male’ after the 7th of February 2012. For me, the term which loosely translates into “Long Live Anni” makes sense in an ethereal manner such that the journey of change that Nasheed started has turned into a movement which has gathered enough momentum to sustain it through the long and hard battle that we the people have to once again fight in order to obtain the right to choose a leader through the ballot boxes and not through bullets. This momentum and movement is what must have scared the perpetrators of the coup that took place on the 7th of this month, toppling the first democratically elected leader of the country while the public watched on, most with disbelief while the rest cheered on, not even wanting to think beyond the euphoria of the moment to go to that point of realization where the gravity of what took place on that fateful day would sink in. My personal experience was one of utter devastation. I grew up with a father who has always spoken against the many inhuman atrocities committed by Maumoon and his cronies while in power. On top of that, I have a strong sense of revulsion towards misuse of authority by anyone and thus the historic election in 2008 which saw the end of an era in the Maldives was one I wholeheartedly approved of and worked for. To see practically more than half of my work mates cheer on that day when it was announced that Mr. Nasheed would resign within the hour, something just broke inside of me and I don’t think it has healed since then. Well, lets just say that the whole day after his resignation was a blur of mixed emotions, a deep sorrow that was barely kept in place because of the support of family members and friends on social networks who believed that democracy and people power should rein supremacy over mutinying armed forces and the influence of the rich and corrupt in the society. But what the then opposition must have once again underestimated is the power of the sheer determination of the one man whose vision of a democratic Maldives was what forever changed the face of Maldivian politics. February 8th showed the overwhelming support that Mr. Nasheed has behind him, the sheer number of people who took to the streets on a peaceful walk outnumbering any mass gathering that had taken place as a political rally in the Maldivian history till then. And I would say it was that sheer number alone that triggered the act of violence by the police towards unarmed civilians, which then set off the events of unrest and violence throughout the country, a blame which the Maldivian Police Service to this day tries to shove on the head of the Maldivian Democratic Party. But regardless of the scare tactics employed by the Star Force of the Police Service to ensure that video footage of their inhuman acts would be far and few in between, the rare video clips that have surfaced tells a story on its own. Rather than hindering the momentum of people’s outcry against the coup, the sheer scale of brutality shown by the Police in itself increased the number of supporters for the ousted leader, perhaps the biggest mistake that Dr. Waheed’s government made since he took over being never once acknowledging or apologizing to the public for the events that took place on the 8th of February. What Dr. Waheed and his partners must know beyond a shadow of doubt is that a man who has even for once tasted the sweetness of freedom would never revert back to slavery and accept it as his due without giving the fight of his life. Multiply that with the number of people in this country who do not want to see a corrupt and inept judiciary, who do not want to hear tales of police brutality and who want to exercise their right to choose their own leader and you get the biggest movement in the Maldives to-date fighting for their rights as the citizens of this country. 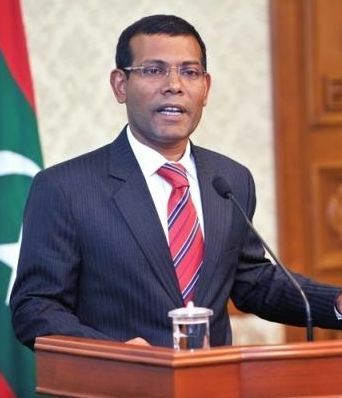 In my opinion, President Nasheed would go down in Maldivian history as the icon behind the freedom movement and would remain as the legend who even now remains undeterred in his fight towards gaining the rights of the Maldivian people against those who are power hungry enough to use every weapon available at their disposal. The philosophy of a Maldives where people have their due rights as per the Constitution would continue to fuel the movement that today seems unstoppable, that gains strength even as I write this and would continue on until the government relents and gives an early election date which would be for once a step taken in the right direction since Dr. Waheed took over. Long live democracy. May the legend of a single man’s fight to gain the rights of his people live on, the movement never slow down and the philosophy of the due rights of the people of this country create the momentum that would in the near future give the people the justice that they deserve! ← Independent Enquiry, Elections & a CLEAN Judiciary Please!